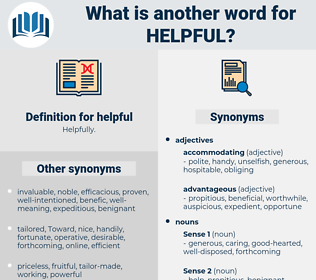 What is another word for helpful? 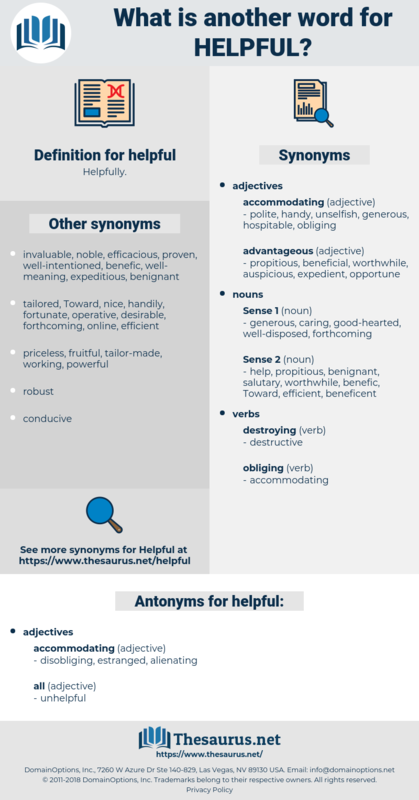 useful, worthwhile, advantageous, instrumental, salutary, beneficial. fruitful, desirable, conducive, instructive, invaluable, advisable, positive, assistance, constructive, successful, interesting, profitable, productive, favourable, informative, pertinent, better, expedient, enlightening, useless, insightful, accommodating, sensible, preferable, precious, useable, thoughtful, efficient, suitable, illuminating, rewarding, healthy, important, contributing, facilitated, worthy, wise, opportune, powerful, welcome, timely, favorable, available. trivial, cool, unimportant, inessential, cold, unsuitable, disagreeable, unfriendly, minor, nonessential, insignificant, unsociable. spiteful, malevolent, unkind, greedy, mean, selfish. hindering, adverse, unfavorable, unconducive, discouraging. inopportune, unadaptable, inconvenient, unsuited, Unhandy, awkward, Unuseful, ineffectual, inappropriate. hurtful, injurious, disadvantageous, worthless, useless, harmful, unconstructive. I have received recently several letters asking for counsel or advice, the principal request being for some incident that may prove helpful to the young. Loyalty might indeed be very helpful to the school, but on this occasion virtue had to be its own reward, and did not meet with any acknowledgment from head - quarters.